On Saturday, January 10th, the V.M. 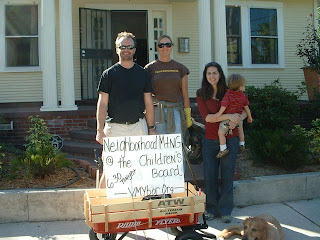 Ybor Neighborhood Association held its first neighborhood clean up. Five of us picked up trash on Nebraksa Ave and Columbus Drive, as well as many residential blocks. We received a very encouraging response from the public and hopefully recruited more people to help in the future. We also took note of multiple code violations. Thanks to Kim & Richard Headland, Barbara Robinson, and Pete Johnson for their help! That's excellent to hear! I live less than 2 blocks from there and am glad things are being done to improve the neighborhood. Are there any other tasks that you can think of that we can do to help? Maybe promote the effort somehow? I'll gladly make a blog post and help get the word out if you have a program put together and contact info I can post.